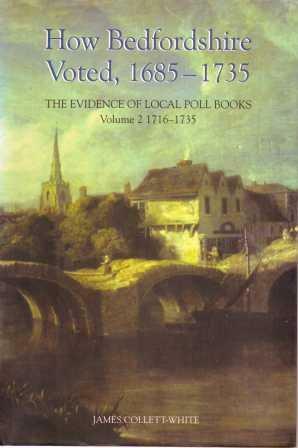 This second volume of BHRS`s series of late seventeenth and early eighteenth century poll books continues the story of Bedfordshire voting in the context of local and national politics up to the election in 1734. It contains transcriptions of the poll books for four Bedford borough elections and three county elections held between 1722 and 1734. Except for the 1722 county election, the poll books are taken from hitherto unpublished manuscripts. Much of the political and local background to voting is recounted in volume 1. For this volume, each chapter has an introduction which draws upon letters to provide an insight into the political alliances and manoeuvres which occurred in selecting candidates, including the part played by the Duchess of Marlborough. The poll books themselves are a mine of local information about Bedfordshire. The 10,000 names in this volume (fully indexed), added to the 8,500 names in the first volume, provide evidence for in-depth study of people, places and landholding in Bedfordshire. They will also help family historians find ancestors between the 1671 Hearth Tax and the 1841 Census. ‘This is the second volume of late seventeenth and early eighteenth-century Bedfordshire poll books. … Ideally the two volumes need to be read alongside each other, since the first provides the crucial local and national context and assesses the poll books as a source for the entire period of both books … As source books, these volumes will be of enormous value to local historians of Bedfordshire, as well as those interested in the analysis of voting patterns at the level of the community and county. Much of the original evidence is hitherto unpublished manuscripts, thus these two volumes make these sources available to a wider audience for the first time.’ – Samantha Williams, Local Population Studies, 2009, no. 82, p. 87-8.